Signed as a free agent on May 17, 2018. Arbuckle originally signed with the Stampeders on Sept. 27, 2016, and spent one month on the practice roster. He also attended Stamps training camp in 2017. Arbuckle attended the 2016 mini-camp of the National Football League’s Pittsburgh Steelers. (Calgary) Arbuckle served as the Stamps No. 2 quarterback for all 18 regular-season games as well as the Western Final and Grey Cup. He served as the team’s short-yardage quarterback and in the regular season he had 35 carries for 73 yards and a team-leading five rushing touchdowns. 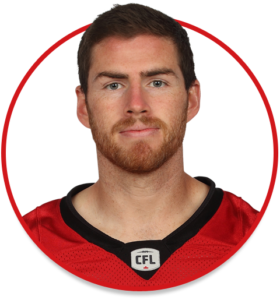 The majority of his action as a passer came in Week 5 at Ottawa as he entered the game late in the second quarter after starter Bo Levi Mitchell went down with an injury. Arbuckle went the rest of the way, completing eight of 14 passes for 84 yards and his first career touchdown pass, a 12-yard connection with Lemar Durant. For the season, he completed 17 of 25 passes for 144 yards with one touchdown and no interceptions. In the Western Final, he had one carry for four yards and in the Grey Cup he carried the ball three times for four yards. (Calgary) Arbuckle signed with the Stampeders on Sept. 27 and spent one month on the practice roster. Arbuckle played two seasons (2014-15) at Georgia State. As a senior in 2015, he was first-team all-Sun Belt Conference and was also the conference’s student-athlete of the year. He set a Sun Belt single-season record with 4,368 passing yards in 2015 and set school records with 307 completions and 28 touchdowns. Prior to Georgia State, he played two seasons at Pierce College in California and threw for 73 touchdowns. Arbuckle was a history major at Georgia State.